While most pot pie recipes are labor-intensive, this recipe is simple and delicious. Pot pies are one of the most iconic comfort foods. They are moderately labor intensive but this recipe uses cheap ingredients to create a meal that can be used for up to eight people or the leftovers can be saved for meal prep. 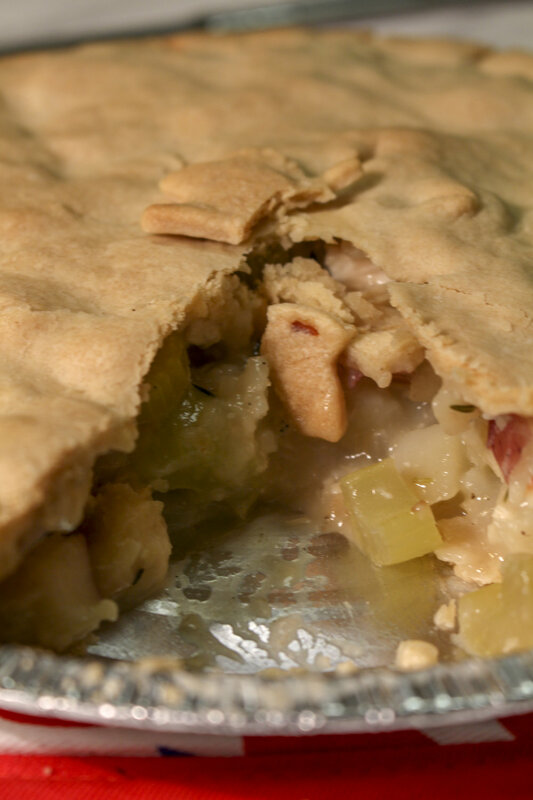 Use this simple recipe to embrace pie crusts as a forgiving and manageable tool and get cooking. This recipe is a vegetarian classic. Pot pies are the perfect comfort food for cold weather. Using a medium sized bowl, bring 5 cups of water to a boil and then add the potatoes for 10 minutes or until the color has become more bright. Drain and set the potatoes aside. In a large pot on medium heat, add the olive oil and then the celery, carrots and onions. Cook until the onions are translucent, about 5-8 minutes. Add the thyme and mustard to the mixture and stir. Slowly stir in the broth and flour until they are thoroughly mixed. Add in the potatoes and cook the mixture for 10 to 15 minutes on medium heat or until the mixture has slightly thickened. Cook the pie for 30 minutes or until the crust is golden brown. Allow to cool for at least 10 minutes before serving and enjoy!